Earlier this week, I shared my struggle with looking like a "cool" model in this style blogging world. As much as I try to make this my own place, it's still easy for me to think that if only my photos were better or if only I were less awkward, then my blog would somehow be better. Self defeating thoughts - I know. It's crazy to think that no matter how much I've worked to improve my blog or my photos or anything I do, I still get sucked into thinking I'm not enough. We all do, don't we? I've mentioned that I'm reading Daring Greatly by Brene Brown and it couldn't be a better remedy for all of the struggles I'm dealing with right now - from being scared to death of launching our businesses to feeling insecure and imperfect. I highly recommend it. This quote about avoiding perfection really hit home. "I remind myself, 'Don't let the perfect be the enemy of the good." (Cribbed from Voltaire.) A twenty-minute walk that I do is better than the four-mile run that I don't do. The imperfect book that gets published is better than the perfect book that never leaves my computer. The dinner party of take-out Chinese food is better than the elegant dinner party that I never host." I would definitely rather be happy with my current best than never do anything because it isn't perfect. If I waited until my posts or my photos were perfect, I would never post around here. I'd rather be imperfectly reliable than too scared to share my thoughts, creativity, or creations. What do you do to keep your perfectionism in check? Yes. Me too. I'm so guilty of allowing myself to feel inferior when it comes to my blog. Oh gosh yes! yes! yes!!!! These have been my thoughts exactly lately... always comparing, always questioning, always wanting more. It's terrible! But this is fabulous... I've got to start thinking this same way! I'm totally with you on this. I think it's really freeing when you realize that, in your own mind, there will never be such a thing as "perfect" -- once you reach the "perfect" you're envisioning right now, you'll notice 10 other things that could be improved. It's a losing battle! I like the quote (paraphrased) "The only person you need to be better than is the person you were yesterday." I think it's a great way to remind myself that I'm on my own journey and that I shouldn't compare. Compare and despair, as they say! 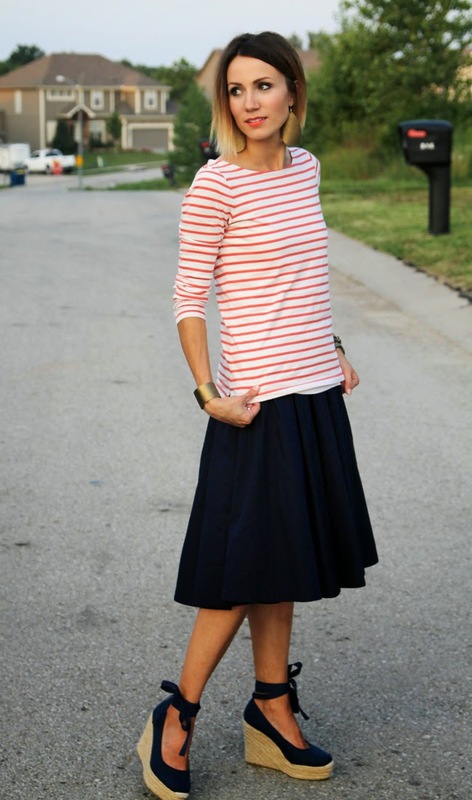 I personally love your blog and your photos and your style :) And those wedges - I love those wedges too. Love your thoughts Kilee! Keep 'em coming! I totally understand. But if that helps, your blog if my favorite style blog among all the ones I'm following !